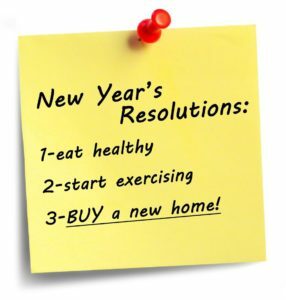 Is Buying a Home One of YOUR New Year's Resolutions? Losing weight, eating healthier, working out are all normal new year’s resolutions. No doubt that these are all great resolutions, however, it is time to stretch them a bit. So many buyers and sellers have been on the fence the last few years. Real estate and home values have shifted so much over the past few years. If you are a buyer who has continued to watch this market and continued to pay rent, take advantage of this amazing time to buy. Investing in a home is a big decision. For some, they are ready now. For others, they are ready but first need to get their ducks in a row. Make this 2017 new year’s resolution to go ahead and meet with a lender and call The Peter’s Company for a free consultation. We will go over step by step on how to buy a home, what you should be doing to get ready and what to expect during the process. Think back to years past when you got to the end of the year and you never completed your new year’s resolutions and goals. For most, they simply were not prepared for changes and would try again next year. When is comes to buying and selling homes, 2017 is going to be your year. Call us today at 404-419-3619 or visit ThePetersCompany.com to get started.